Pak Suzuki is yet to finalise the pricing of the eighth generation Suzuki Alto, but people in the know of the development have said that the MT configuration will cost around 9 to 10 lacs and the AMT configuration will retail at around PKR 10+ lacs. However, it is also anticipated that the price of the car will remain under pressure in case the rupee further devalues against the dollar. 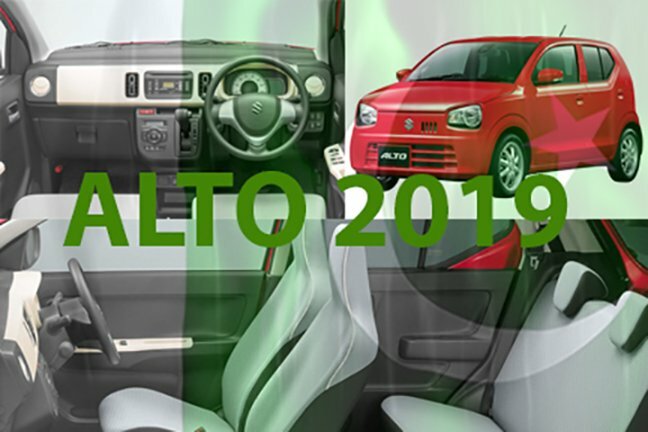 According to sources, PSMCL is probably to display and book limited units of new Alto vehicle at the Pakistan Auto Show (PAPS2019) to be held from April 12-14 in Karachi. The JDM-spec Suzuki Alto is a Heartect platform product. It measures 3,395 mm in length, 1,475 mm in width and 1,475 mm/1,500 mm in height. It has a 2,460 mm wheelbase. Under the hood, there’s the R06A 0.66-litre naturally aspirated three-cylinder petrol engine that produces 49 PS/52 PS (VVT) and 58 Nm/63 Nm (VVT) of torque. 5-speed manual and 5-speed automated manual are the transmission choices. It is still not confirmed that whether it will offer the R06A naturally aspirated engine with the two versions. The engine will come from Japan, while the transmission will get locally assembled. The Suzuki Alto 2019 will have three variants. Two variants will be manual, and one will be automatic. The high spec manual variant and the auto variant will have a power steering. According to our information, the car will have a similar transmission as that available in Suzuki Wagon R.
However, there is so far no information about the content of the localized parts in the Alto. Some vendors are of the view that Suzuki will initially start assembly of the car with 50% of local parts and then increase the production in upcoming years. Sources in the PSMCL said the company would utilize 80pc of Mehran vendors for manufacturing Alto 660cc parts and accessories and with time these vendors will gradually expand their business with increasing localization and sales of the new vehicle. Just last week, PSMCL had halted booking of Suzuki Mehran (all versions) from April 1 following discontinuation of its production. The company informed its authorized dealers that all pending orders received till April 4 would be delivered within the commitment.